Rome is located on the Tiber river about 20km from the Mediterranean Sea. 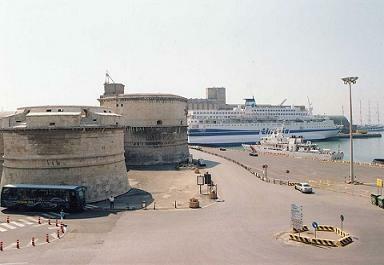 The cruiseships can’t sail on the Tiber but port at Civitavecchia. This city is located 80km from Rome. It has a population of 51.000 people. The large cruise/ferry port has scheduled services with Barcelona, Malta, Sardinia, Sicily, Toulon and Tunis. Near the cruise port entrance is a railway station with trains to Rome. Shuttle busses transport passengers from the ships to the port entrance. Taxi’s are also available but when a cruise ship embarkes there are not enough taxi’s. It’s about 10 minutes walking from the cruise port entrance to the railway station. In the railway station is a ticket counter where passengers can buy train tickets. The ride to Rome takes one hour; the first stop in Rome is railway station San Pietro. Station San Pietro is about 800 meters from Saint Peters Square. From Civitavecchia to Rome Termini Station (central station) is 1 hour and 17 minutes. Most trains to Rome are regional trains. Ticket price is €4.60 one-way. The Intercity trains (IC) to Rome are 20 minutes faster and cost €9.50 one-way. First class is €12.50. The fast train FressiaBianca to Termini Station takes only 45 minutes and cost €13.50-€19. The latest prices and time schedules can be find at the website of the Italian Railways. First train from cruise port Civitavecchia to Rome is the local train at 05.05; arrival in Rome Termini Station is 6.25. At Termini Station both metro lines of Rome have a stop. The next departures from Civitavecchia to Rome are on average two times an hour. The first IC train from Civitavecchia is 9.18: arrival in Rome is 10.25. Buy your train tickets in time if you plan a visit to Rome by train. There are only a few fast IC trains. The last train from Rome Termini Station to Civitavecchia is the local train at 23.27; arrival in Civitavecchia is 00.44. The fixed price for a taxi ride between Leonardo da Vinci-Fiumicino Airport and cruise port Civitavecchia should be €120.